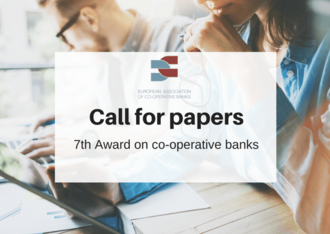 The European Association of Co-operative Banks (EACB), in collaboration with its Academic Think-Tank, is pleased to announce a competition for best papers in the field of co-operative banks. The competition is targeted at young researchers up to 35 years old (i.e. they should be born in 1983 or after). Co-authored papers will be accepted if all authors are up to 35 years of age. Contributions will be accepted providing they are not already published in scientific journals or books by 28 February 2019. However, papers that have appeared in working paper series or that will be forthcoming in a publication after 29 February 2019 will be considered. The submitted papers should follow the standard format of scientific journals, and should contain new and original work by the authors. The word limit is around 10,000 words or less. • Are there distinct characteristics of co-operative banks (the co-operative difference)? rigor of the argumentation, the clarity of exposition and policy relevance. The prize for the best paper is 2,000 Euros. The best papers will receive a special mention and will be published by the EACB. The prize will be awarded in Spring or Autumn 2019.